Different style nails. Note the squared off bottom on the right. A few weeks ago while in CVS, my neighborhood beauty expert caught my attention with her snazzy nails. When I asked her about them, she told me they were from the store!! KISS has a new collection out called “Masterpiece” and I was blown away at how good they looked. They looked just as intricate and real as a lot of the designs I’ve been seeing on the ‘gram. Now y’all know I love me some press on nails and have been using KISS nails for a while, but I’ve been trying to behave and work through my current stash and my #NoBuy. So I said I would hold off on it. Fast forward to last week.. I’ve been sick and in a not so great mood and wanted some retail therapy. Lo and behold CVS emailed me a 40% off coupon and BOOM I knew EXACTLY what I was going to use it on. Cold medicine? Psshhttt nope! I picked up a set of the Masterpiece collection in “Everytime I Slay” (which OMG the names are to die for!) They weren’t my first choice, I really wanted “Kitty Gurl” because those are stilettos and the ones that caught my eye when she was wearing them. But these aren’t bad either. I wanted to see how these stood up to the regular KISS nails that I’ve been wearing. With all these rhinestones and longer length, how will they last under normal wear and tear? I had nowhere to wear these to, no events coming up, but I definitely could not wait to get these babies on my hands. I had to stop myself from putting them on before I got some pics for you guys. These are a longer length coffin/ballerina than I normally wear, but they are gorgeous. 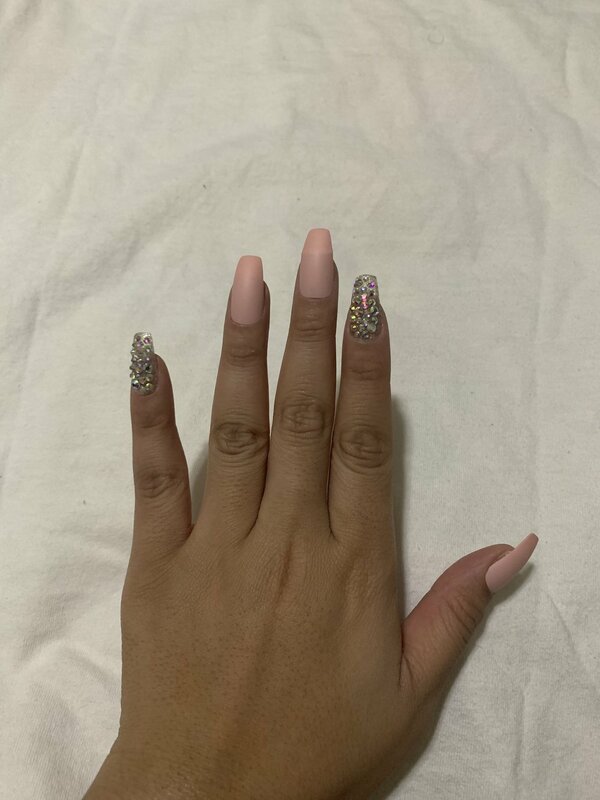 Typically with these nails, the prettiest designs are on the smaller fingers for ring/pointer, but they almost never work for me because my nail beds are so wide. With these it was no different. The fancy rhinestones and holographic nails only fit my pinky and index fingers. But the shapes on the matte nails were a little off from usual. 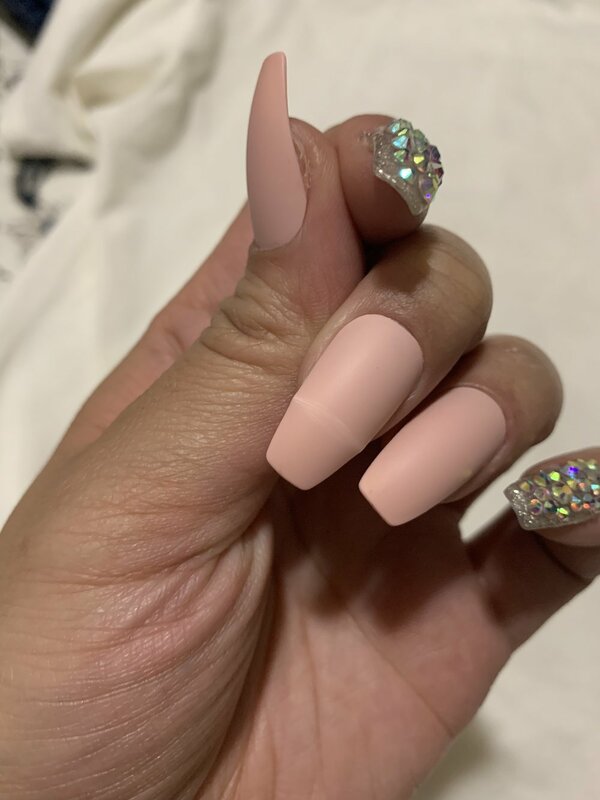 The bottom that fits against your cuticle was square-ish on the larger size nails and more traditional rounded on the smaller nails and fancy ones. Since my nail beds are wider and longer, I had to shape the edges of the larger nails to fit properly. These are also taper very narrowly, so even sizing up, my natural nails showed underneath the press ons. With the other coffin nails I’ve used, I’ve not had this issue before. So from a distance the nails look fine, but up close you can tell the horrible fit. However, these are not long lasting. The next day I had 2 nails pop off while I was putting on my jeans. That’s never happened with any nails before, not even the other Kiss collections! I can only attribute that to the fit of the nails not being proper. By the end of the second day of me wearing them, I had 2 bent nails on my middle fingers. I was disappointed because I really wanted to love these. After day 3, I had 2 more bent nails, and the holo on my right index finger was peeling. This is all with normal hand usage – washing dishes, getting dressed, typing on my phone and keyboard, doing my hair.. I know without a doubt they would not have lasted if I wore these for a show. Typically the other Kiss collections do last when I am packing up and opening boxes for work or doing anything rougher with my hands. These are strictly for show only. At the end of Day 3 I took them off and trashed them. The only nails I kept were the shiny rhinestones. I would not recommend these for anything more than a 1-2 day event where you will not be using your hands often. I still want to try some other designs, but am more hesitant. For now, these are not on the top of my list, but Kiss press ons still hold a place in my heart.